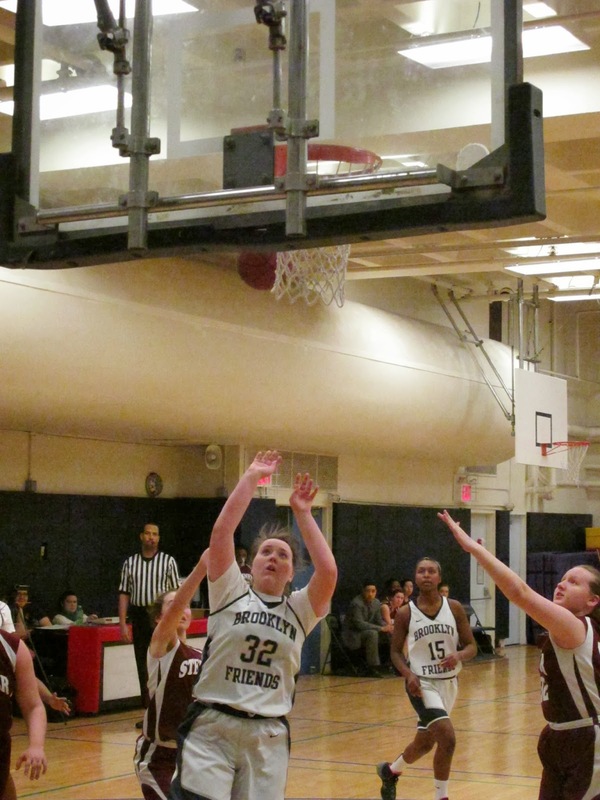 On Tuesday the BFS Girls Varsity Basketball team defeated Rudolph Steiner 36-25 in the lower gym. The team picked up its 11th win of the season (9-5 in league play). The team got off to a great start. They controlled the game on both ends of the court. Senior Chloe B. and junior Julia B. each scored four points during the first quarter. BFS led 10-5 after one quarter of play. Julia B. added another four points during the second quarter and freshman Ivy L. knocked down two sweet jump shots. BFS found themselves up 18-14 at the half. Julia B. continued her consistent scoring with four more in the third quarter, and Chloe, junior Maret S-M had two points and sophomore Abby M. added a free throw during the quarter. BFS took a 27-19 lead into the final quarter of play. Julia B. added five more points to her game high total of 17, she also grabbed 18 rebounds. Ivy knocked down another nice jumper and Chloe added another basket on a great give and go play. Chloe finished with 8 points, 4 rebounds, 2 blocks, and an assist, while Ivy finished with 6 points, 5 steals, 3 rebounds, and 2 assists. This may of been the last time the seniors took their home court. They were acknowledged by the home crowd. Senior point guard Julia G., center Chloe B, and forwards Sarah M., and Aria C. will be remembered for all their contributions on and off the basketball court. Blue Pride!! BFS looks to finish their season in good fashion as they take on two of the top two teams in the league on the road next week. The team is still hoping for a playoff berth. Stay tuned…. 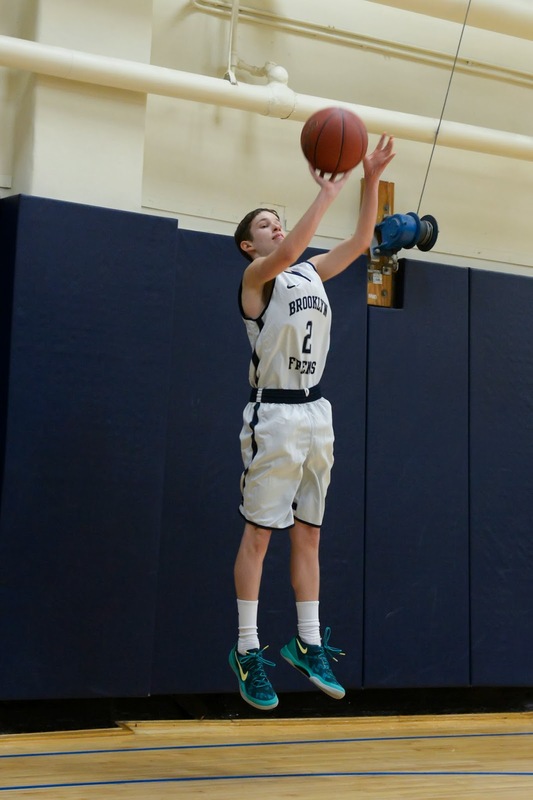 On Wednesday the BFS Boys Varsity Basketball team defeated St. Ann’s at the buzzer on a three pointer by freshman Brendan G. 51-50 in front of the home crowd. With 5.1 seconds left and BFS down two points, the ball was inbounded and passed ahead on the left side to Brendan who caught the ball calmly at halfcourt, took, a dribble, and fired up the winning shot. Celebration time, come one…BLUE PRIDE!! Brooklyn Friends comes away with a 1 point thriller over St. Ann’s in an ACIS league game. 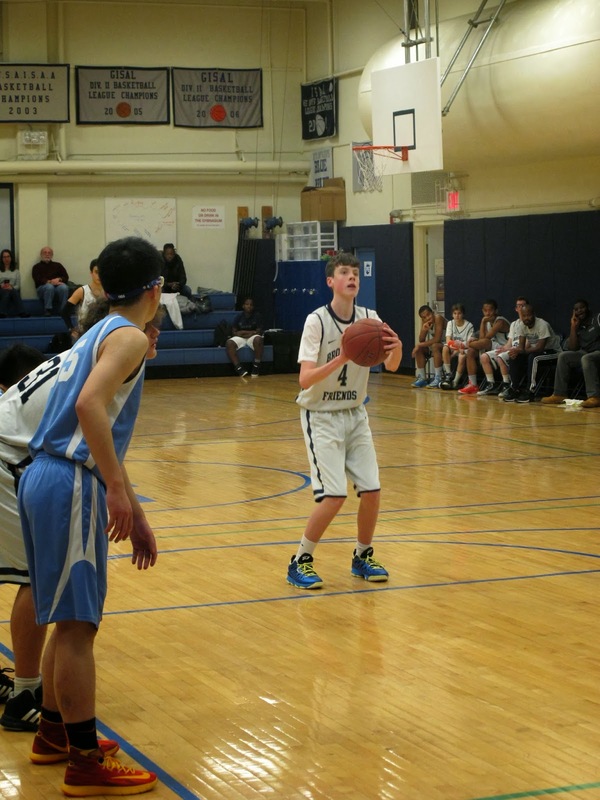 Freshmen guard Brendan G., hits the game-winning 3 pointer at the buzzer to give the Panthers the win. After trailing by as much as ten points in the 3rd quarter, BFS made a 16-3 run to gain a four point lead with the help of pressure defense from Jumoke M-T, Quran D., Phil C., and Nathan J. Both teams battled back and forth in the final quarter as the biggest lead in the quarter was four. With a minute remaining, senior guard Adam G., hit a three pointer that gave the Panthers a two point lead. But St. Ann’s answered back a few possessions later with a three pointer of their own to give them back the lead. All this led to a dramatic ending with a three pointer at the buzzer. Senior guards Nathan J., scored 17 points,12 rebounds, and 4 steals and Adam G., scored 14 points, 6 rebounds, and 2 steals led the way for BFS. Sophomore point guard Quran D., scored 11 points and junior forward Adam W., scored 4 points and grabbed 8 rebounds.